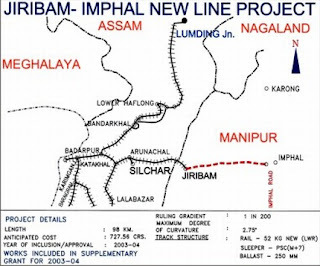 New Delhi, Oct 26 : The new Jiribam-Imphal railway line will be extended from Imphal Road to Imphal in Manipur for Rs.4,444 crore. The new line will be completed by March 2016, official sources said Thursday. The Cabinet Committee on Infrastructure approved the proposal of the railway ministry. Around 25 percent funds for the project will come from General Budgetary Support (GBS) for railways and 75 percent from the finance ministry. The project will cover Imphal East, Tamenglong and Senapati districts of Manipur.